Eyewitnesses in Rochelle claim to have seen operatives who are part of the US Military’s Jade Helm 15 exercise. 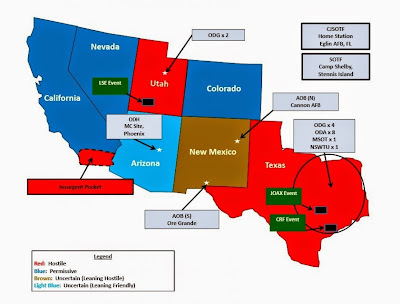 While the military claims that Jade Helm 15 is only a multi-state training exercise, some critics, like Chuck Norris, claim that it is really a campaign to place the Western United States, including Texas, under martial law. Paul X, a “covert historian” living in a compound outside of Malta, believes that Jade Helm 15 will lead to World War III, which could result in the United States being divided between Mexico, Canada, and the United Nations. Northern Illinois could become a part of Canada. “There’s never a bad time to stock up on ammo, and this is an especially good time!” Said X.